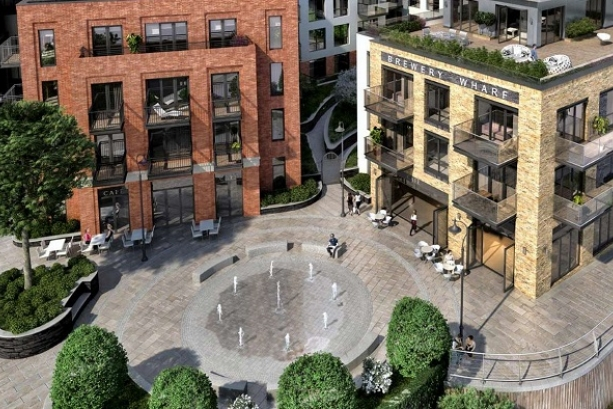 Hermes CBS has secured the 1st and 2nd fix carpentry contract at a luxury housing development at Brewery Wharf, Twickenham. The site will include 82 one and two bedroom apartments and 28 three storey townhouses located opposite Twickenham train station. Our scope will mainly consist of the installation of eco joists with chipboard flooring, trussed rafter roof construction, timber cladding to concrete stairs, satin stainless steel ironmongery and provision of luxury joinery items in the bathrooms. The apartments will be retailing for between £550,000 and £2million, so all joinery items are of a high specification, including HiMac Sinks and splash backs, mirrored bathroom cabinets and timber vanity units. Rainsford will also be completing the Site Accommodation set up, with stud partitions and floor coverings for the duration of the project. This is the second former Royal Main Sorting Office that the Elliott Thomas Group has been involved with, after Elliott Thomas Logistics provided a comprehensive package at Rathbone Place, London for Great Portland Estates.